Mr Lim San’s good class bungalow (GCB) at 81 Dalvey Road came to the market for sale on July 31. The GCB is expected to fetch prices above $100 million. The good class bungalow’s proximity to Botanic Gardens and its large plot size of 51,058 square feet, as well as it being situated on high grounds are all cited as reasons for thigh price tag. Mr Lim is credited for leading the successful public housing program in Singapore, which eased the acute housing shortage problem at that time. In 1960, Lim was appointed the first Chairman of the Housing Development Board. Due to a rapidly increasing population, more than 400,000 people were living in over-crowded conditions in ramshackle “chophouse” buildings or in squatters with substandard living conditions. At this time, Lim was appointed to the Housing Development Board. He had volunteered for the job and had not been paid for three years. Prior to this appointment, Lim helped his father run the family’s businesses in rubber, commodities, salt, sago and petrol. After the Japanese Occupation, he went into banking and the sago flour and sago pearl business. It was in this position that Lim oversaw the massive construction of high-rise, low-cost apartments that will eventually become the main source of housing for Singaporeans. Lim known for his organizing and planning abilities, forwent a detailed planning stage and instead chose a “rough and ready” approach to work fast using rough estimates of the housing requirement. In the first two year of this crash program, over 2000 units were built. This supply was more than what was built in the previous decade. In the first Five Year Housing Program, HDB achieved its goal of completing 5,000 units of housing by 1965. The largest project at that time was Queenstown, a satellite town of more than 17,500 apartments capable of housing close to 22,000 people. The new neighborhood was built as a self-contained entity, with all amenities and shops built along with the houses, so people would not need to travel to other areas for basic necessities, thereby lowering traffic congestion. This philosophy (which was ultimately extended with the concept of regional centre), is generally accredited by many to have significantly contributed to the lower rate of congestion and burden on the central business district than before. In May 1961, after the Bukit Ho Swee Fire broke out and some 16,000 people became homeless, Lim guided the relocation and reconstruction of the lost housing was completed in just over four years. 1200 housing flats were quickly made available to those who lost their homes in the fire. Lim was widely recognised and known as “Mr HDB” for these reasons. He quit politics in 1980 but remained active in public life well into the twilight years of his life. After a long illness, Lim died on 20 July 2006 at his home. 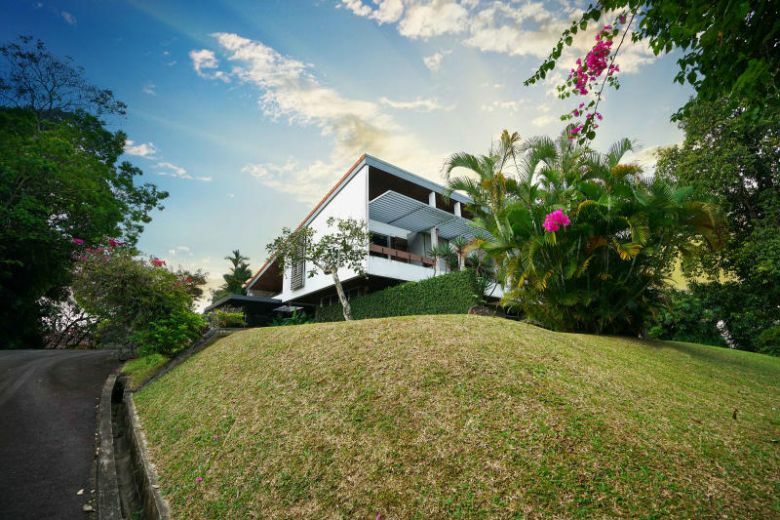 The marketing agent of the good class bungalow said the property built in 1967 by Mr Lim is within the White House Park GCB area and is one of the most sought-after properties among the 39 gazetted bungalow zones there. Mr Tan Hong Boon, regional director of JLL said: “Dalvey Road … is the premier address to homes of the who’s who in Singapore, including foreign high commissioners and ambassadors.” He declined to comment on why the residence is being sold now. According to earlier media reports, prominent local personalities like Glen Goei had previously occupied the good class bungalow. The house is now vacant. The marketing agent said that the good class bungalow on sale may be subdivided into three bungalow plots. Or the land could be sub-divided into two large good class bungalows – or a buyer may just keep it entirely for his or her own use. These prospects are expected to increase the appeal of the GCB to developers and investors looking to develop homes in a prime area. The tender for the property closes at 2.30pm on Sept 12. The sale of the good class bungalow come at a time when URA Q2 statistics showed that prices of landed properties rose by 4.1% in 2nd Quarter 2018, compared with the 1.9% increase in the previous quarter. The Urban Redevelopment Authority (URA) has gazetted 39 GCB areas, which are the pinnacle of Singapore’s landed housing segment. The URA has stipulated strict planning conditions for GCB to preserve their exclusivity and low-rise character. URA also requires GCB to have a minimal plot size of 1,400 sq m or 15,069 sq ft – but those with land plots smaller than the stipulated size when the 39 GCB areas were gazetted in 1980 are still classified as as such. An earlier JLL Research noted that the buyer pool for GCB was small and that new citizens who were originally from China, were prominent buyers of such exclusive property. Besides the new citizens, buyers of GCB also comprised of Singapore corporates, ultra-high-net-worth Singaporean families and Singaporean entrepreneurs in their 40s. Coveted address, prestige, exclusivity, wealth-preservation quality and measure of their financial success, were all reasons for such buyers to seek GCB. Many high net-worth individuals who became Singapore citizens around a year ago believe that the time is ripe to invest in GCB. This positive sentiment about the GCB is driven by the buoyant private residential market. The many prominent en bloc sales since the middle of 2017, has also contributed to the positive market sentiments. Despite the restricted demand pool, prospective sellers are expected to raise or be firmer on their price expectations in 2018, said JLL. This is because sellers are mindful that GCB will further enhance the wealth preservation quality for the buyers. But the prices of GCB are expected to be tempered by the new property cooling measures.